This is the introduction and navigation around my Travelogue site. Wander around here awhile or jump straight in using the top row of blue menues. The Spirit of Encounter web site mentions an address of 267 Old Brompton Road. I remember an address of 281 Old Brompton Road. I will have to do some more digging. Encounter Overland had two livery colours, bright orange and pale blue. Although the early vehicles were ex-military they wanted to ensure that the trucks were not misidentified as army trucks as some of the countries traveled through were not as stable as might be desired. You can see both colours in the following YouTube videos. In my time the trucks for Asia and Africa were mainly Bedford MJ 4x4, with one Bedford KM 6x4 if my memory serves me correctly. Above is a 1995 Trans Africa YouTube video created by Dave Highbury. It shows to me that despite the trucks being more modern in 1995 there were still a lot of similarities to my 1979 trip. Below are two clips from 1980, the same era as my trip. Above are two 1980 Trans Africa YouTube videos posted by a long term Encounter Overland driver / leader. Well there were two, but the backing track was subject to a copyright dispute. Hopefully both will be up again soon. Although not Encounter Overland, clip 1 above shows how dangerous overlanding can be, even for experienced people. I recall hearing of a passenger walking in front of a truck at a river crossing, getting washed away by the current, and drowned. Not good. We always tied them to the bumper with rope. A strange sight, but better than being killed. The two clips below provide an overview of a Bedford MJ 4x4 by GoldieVideo. The Bedford is a good basic, simple and versatile truck well suited to overlanding. In its day it was one of the best all rounder medium mobility trucks that sold in various forms all over the world. Bedford’s market penetration resulted in readily available spares. Thirty years later spares are still available, albeit not as easily. See www.johngoldie.name - John Goldie describing a Bedford MJ 4x4 Overland Expedition Safari truck in Nairobi, Kenya on the 29th of July (part 1). See www.johngoldie.name - John Goldie describing a Bedford MJ 4x4 Overland Expedition Safari truck in Nairobi, Kenya on the 29th of July (part 2). Bedford MJ 4X4 Truck off roading at Tank Mania near Measham 13/11/10. Czech truck TATRA is best truck ever! What Will the Work Entail? Low pay but travel formalities are taken care of. Essential to get on with people in claustrophobic conditions. Stamina and endurance a must. Not a lot has changed since ‘79 then. The drivers based at the workshop used to stay in a communal house, about a 20 minute drive away in the small town of Hitchin. The house was near the town centre, in Walsworth Road, if I remember correctly. I do remember however, the cold winter nights. My bedroom was at the top of the house with a sloping skylight in the ceiling which would frequently have ice on the inside when I woke in the morning. Heating for the house consisted of a few electric storage heaters. That aside, it was a good to live there with the other drivers. We did a little decoration and maintenance in the short time we stayed between trips. Then other drivers returned and took our places. 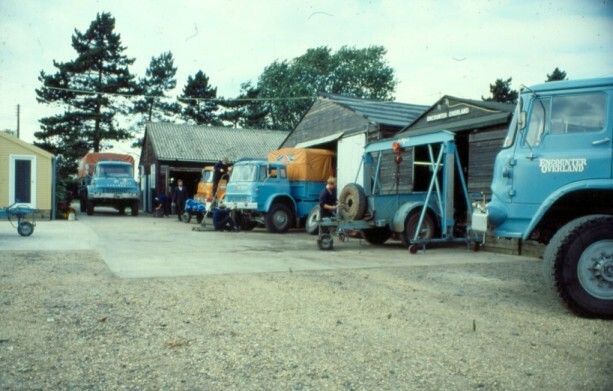 This photo is of the Encounter Overland workshop in Hitchin circa 1980, according to the caption of the photo uploaded by David Hunter, one of the other drivers. I found this photo along with a number of others at the Spirit of Encounter web site. Each weekday we would scramble into the company van and drive to the workshop. There we would clean the trucks from the previous trip and repair all manner of things as required. This could include a full engine rebuild with new big ends and piston rings if necessary. On one occasion I was asked to repair part of the exhaust of the KM. This involved welding of thin metal, a particularly difficult task. I heard months later that the repair failed in Turkey. The driver, a capable young lady sorted out the problem and continued on their way to India. She told me off appropriately when we met later. Once repaired of all reported faults the trucks were fully serviced. Servicing was always carried out thoroughly, as it is more difficult to repair a truck in deepest Asia, Africa, or South America than in the UK. Once mechanically sound we re-sprayed the trucks. All of this was done by the drivers in the workshop, based on the farm. Then the preparation began. All the spares for servicing the trucks on the next trip were securely wrapped and waterproofed. The same happened for the more probable spares to repair breakdowns. The mechanics tools and equipment loaded, followed by the spare springs and sand mats. Another photo of the workshop. My truck was nearly ready by now. The tents, camp beds and the rest of the camping equipment was loaded aboard. Then it was time to do some shopping. We drove to Bedford, the county town, to shop in the cash and carry / supermarket. All the provisions necessary for the trip which could not be provided for locally on the trip. It is an interesting experience to buy quite so much in one go. It dwarfs the weekly shop in the local supermarket this week. Fuel and oils, and now all is ready for the trip ahead. The next morning I jumped into the truck at the workshop with all my kit for the next year away from home. I drove to London, parked up and stayed in the company’s London flat. The next morning it was a short drive to the company’s office at 267 Old Brompton Road, Kensington, London SW5 9JA. I also seem to recall something about 281 but have yet to track down what. A poster of the typical EO truck of the day. A photo of a driver / leader fixing his truck away from the workshop. Overland to India, Africa, South America what better way to experience the World. The journey was long and not with out its risks, but the adventurous wanted to go, all they needed was an inexpensive option. I have written to the site owner to seek permission to display some of his items on Encounter Overland. In the meantime please follow the links. The above extracts from his very interesting site are acknowledged with thanks. Ad from "Trail Finder" newspaper March 1976 This resolves the address issue, 280 Old Brompton Road. Attached some old photos from 77 and 78 that may jog some fading memories out there. The trick to not driving off the road when crossing a flooded river is to ask a few luckless punters to walk in front of the truck and blaze a trail! If I remember we did tie them together though! The stuck in the mud shot was actually outside Kathmandu Guest House on day one of the trip! Oh look "He's fallen in the water"
Thanks again to Derek for his site. I can't remember the exact details of how I was wandering along Old Brompton Road, suffice to say that was what I was doing. I saw the Encounter Overland shop front much as you can see it in the photo above. I climbed the stairs to the office asked for a brochure, had a quick flick though, and then asked if for a job. I did not have an appointment, so knew I was trying my luck. I explained that I had just returned from Asia, Europe and North America. I was shown up another flight of stairs. I met with Tony Jones, and I think it was Ian Way, if he was the occupant of the hot seat at the time. We chatted for a while and then he said he had to go up to the workshop, did I want to come. In truth I can't remember whether it was that afternoon, or the next day, and if the next day whether I stayed in the company flat or with my brother. Either way we went up to the workshop at Wren Park, Bedfordshire. The map below shows the two locations. The route between the two will have varied over the years following roadworks. Along the way we talked about opportunities in Kathmandu and other areas of Nepal. Looking for value added schemes such as white water rafting and trekking. These could be optional extras to add to the end of a trip. Run by a combination of drivers waiting for their homebound trip and locals. The King of Nepal was still considered a deity at the time and there were numerous restrictions, including foreign involvement. The maximum allowable foreign ownership of a Nepalese company was 49%. Only Nepalese companies were allowed to trade in Nepal. So, effectively you had to find a partnership, but you could never be in control. This was a risk. It was a very fruitful journey as we got on well and shared views on a lot of the things discussed. Tony Jones ran the company. He was either the sole owner, or co-owner at the time. Before the end of the day I had a job as a driver for Encounter Overland. One of the best companies of its type in the day. And that is how I joined Encounter Overland. It is coincidental that the photo of Ian Way with the truck has an inflatable on the cab. Well, firstly it is a made-up word referring to travel overland, made into a verb by adding 'ing'. Leaving that aside, overlanding, in my humble opinion, (is that now known as imho?) is a form of tourism. The truck driver who drives her load from London to Istanbul is not overlanding, but is however traveling overland. Overlanding is tourism with added adventure, excitement, thrills, and adreline. It is not without risk, and occasionally has unfortunate consequences. The organized trips, such as those by Encounter Overland and Exodus, try to create an atmosphere of exploration and expedition, which I think they generally do reasonably well, but it is not real exploration as the routes are well known to the companies and drivers. Even the out of the way places, have already been reconnoitered by the company. Please don't think I am in any way trying to put down the companies or drivers. The routes they offer are frequently well away from the beaten tourist routes and it is a far cry from the quick trip down to the Costa del Brit. All I am trying to say is that it is not the full Monty expedition where you set out in the morning truly not knowing where you will get to nor what you will encounter on the way. So, back to tourism. It is an adventure. You go to places you may have never dreamed of. See things you will remember for the rest of your life. But the experience! The experience has the potential of being mind blowing suburb. The external experience will be, but can be affected by your fellow travellers. The internal experience comes down to the group you are travelling with in the end. A good driver / leader can influence the group to an extent, and provide the environment for exceptional team interaction and boding. A good group, with a good driver, and a good company (yes, in that order) has the potential to be a trip of a lifetime. It will be written up in the companies in-house magazine, and told to children and grand-children for years to come. Conversely, a group, that, for whatever reason, will not gel, will not get on with each other, forms cliks, and plays politics will get significantly less out of their trip, irrespective of driver or company. Sometimes, with a very good group, a driver may try to vary the route from that normally taken. Whilst on my first trip to Asia, we were approached by a overland driver in Herat. He wanted to drive through the centre of Afghanistan, over the mountain passes, through the Hindu Kush. This is a much shorter route than the southern route via the Desert of Death and Kandahar. It is also, by repute (at the time) much more difficult. A lot of the route is reduced to single lane dirt tracks with no truck size traffic. Donkeys would be a more normal sight. The drops off the side of the road, splendid, and scary. 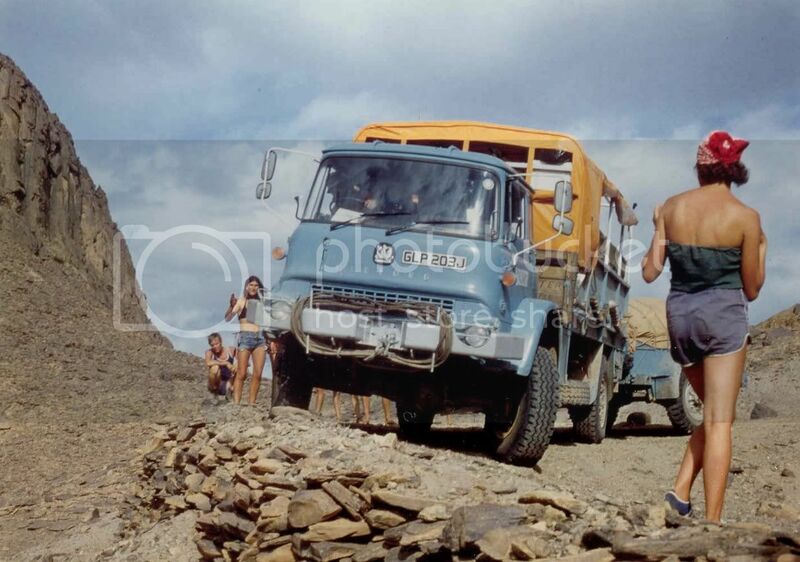 He was looking to maximize his groups experience, with added adventure in the bucket load, whist trying to mitigate some of the risk, by having another truck accompany him. Just a quick reminder, as we have become so accustomed to our instant world, there were no mobile phones, or any other form or portable communication available to either the driver or us. You were on your own, and if something tragic happened, help was at the end of a long donkey ride. I must admit that it was a very attractive proposition. However, our truck was only two wheel drive, with standard suspension and had a longer wheelbase than his truck. It also had rigid sides. Do I here a 'What difference does that all make. It means that whereas his truck may have been able to navigate the mountain passes, we were less likely so to do. The people you travel with make the difference. After all, you are living with them, in close quarters, all day, every day. (24/7). That is more intense than most married couples. They were strangers at the beginning of the trip, and a few weeks in and you are sharing a mixed bath with them! Inhibitions dissipate quickly when you are overlanding, by necessity. There is often a degree of hardship as well. Tents, rough camping, creepy crawlies, dirt, dust, and more dirt. The food is different, the shops are different, in fact most things are different. And you have to get on with each other, and act as a single coherent team. Independent overlanding is somewhat different again. I will only deal here with trips with your own transport, as this is where the majority of my experience of overlanding lies. In all probability, you know the core team before you set off on the trip. However, this is not a guarantee of compatibility because the same people issues due to intensity and proximity apply. Team interaction is just as important. The really big difference with the self organized independent trip, is if you pick up a passenger along the way that does not fit in, you just say goodbye. Problem resolved. It is still all about the people. Enough of trying to give a flavour and explanation of 'What is Overlanding' Read the stories and get the inside info.